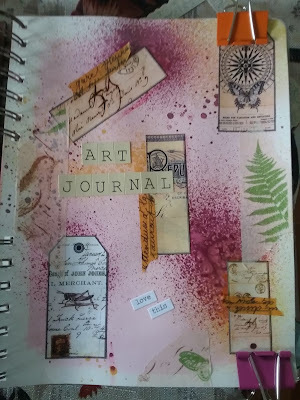 I've been spending a lot of time working in my Art Journal lately. I recently received an order of BoBunny goodies that I ordered online so I have been having fun using all those elements in my pages. This page celebrates my love of Mondays, the ones I don't have to go to work on any way. The new BoBunny Madeleine Collection has the prettiest hues of pink and teal blue. In order to get the pretty teal blue background color I mixed Ocean Green Crafter's Acrylic Paint with white acrylic paint and applied it to both pages of my journal. Then I used a wash of white acrylic mixed with water so it was really translucent. 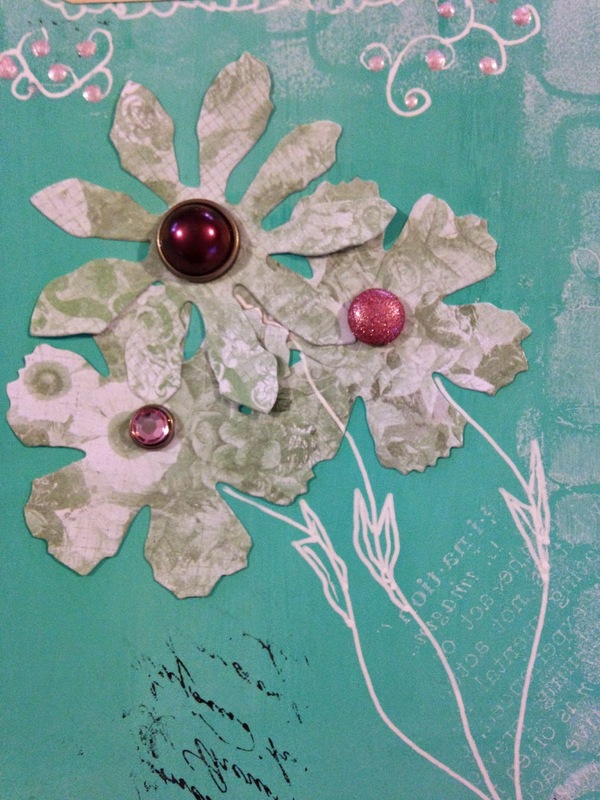 Next I added texture with a Spellbinder's Impressabilities Die which I used as a stencil, applying gesso through it. In continuing to build up my background I used a Tim Holtz stamp and black Stazon ink to randomly stamp script over my background. I also used white ink to stamp Tim Holtz typeset around the page. I added a Monday sign that I got from Pinterest http://www.pinterest.com/source/onevelvetmorning.wordpress.com/ and a butterfly printout from Etsy shop, Digital Antiques. Then I sprayed both pages with Perfect Pearls to give it a pretty sheen, I doodled around the page with a white Uniball pen and added some BoBunny Liquid pearls.